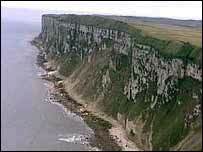 A lightning strike has taken a large chunk out of the cliff face at a beauty spot on the East Yorkshire coast. The bolt hit the south side of Flamborough Head during a severe storm on Wednesday night - sending 100 tonnes of rocks crashing into the sea below. Coastguards who assessed the damage on Thursday said a column of rock known as a buttress had been blown away. Watch officer, Mike Puplett, said: "It was already dangerous due to erosion but this has exacerbated the problem." Flamborough Head is one of the most spectacular areas of chalk cliffs in Britain, standing 400ft (122m) high. The cliffs are home to one of the largest sites of nesting sea birds in England, boasting a rare colony of gannets. Mr Puplett said: "We could see the lightning strike from our base last night and it was a pretty spectacular sight," he said. "The damage caused by the lightning and the heavy rainfall has made the cliff top very unstable so we would urge people to be very vigilant or, better still, avoid the area."